Citizens for a Fair Count! The Nation's First Website Dedicated to Exposing and Combating Easily Rigged, Secret Computer "Counts"
The Fight for Honest Elections! Stalin's quote (or variations thereof) has become surprisingly popular since it first appeared on Citizens for a Fair Vote Count's former website in 1996. We assembled numerous links that examine the question of the quote's authenticity, the use of it in different contexts (it's been invoked by individuals with views as diverse as Rush Limbaugh and Alan Dershowitz!) and we even found some Stalin era election poster art, including one that shows the dictator casting a ballot. While a primary source for the quote has yet to be uncovered, there is no question that a truth is contained therein. 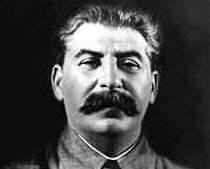 For more, go to The Josef Stalin Vote Fraud Page. "I've been saying all along that my biggest fear is that someone would program a machine to give a wrong answer. If that were to happen, the machine would still work fine - we just wouldn't know it." Note from Jim Condit Jr., Director of Citizen for a Fair Vote Count: Professor Avi Rubin has been shaky on embracing real solutions to the votefraud problem -- and, as far as we know, still advocates hanging onto some kind of computer to "count" votes. This is typical of people in the computer field. "Why am I always being asked to prove these systems aren't secure? The burden of proof ought to be on the vendor. You ask about the hardware. 'Secret.' The software? 'Secret.' What's the cryptography? 'Can't tell you because that'll compromise the secrecy of the machines.'... Federal testing procedures? 'Secret'! Results of the tests? 'Secret'! Basically we are required to have blind faith." 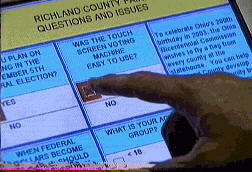 A cutting edge article analyzing the dangers of e-voting. –Vote recount to settle doubts? In the hopes that Reform Presidential candidate Patrick Buchanan or Constitution Party candidate Howard Phillips would be able to remain a factor in the 2000 Presidential election -- about 120 activists from 20+ states met in the Ramada Inn at the Greater Cincinnati airport from August 25 to 27, 2000. Several of the delegates were not for either of the above mentioned candidates, but were for Charles Collins (independent), or Ralph Nader (Green Party), or Harry Browne (Libertarian) or someone else. All present were concerned about the integrity of local, congressional, and Senate races as well. All present realized that the "honest elections vs. computerized votefraud" issue cut across the board and was bigger than any one election or any one candidates; an honest and open vote count is the RIGHT of every American voter. Since honest elections are a pre-requisite for Freedom, two Freedom awards were given out to individuals who made a valiant fight for freedom in the year of 2000. A little background regarding the origins of our website, including recognition in 1996 from Popular Science magazine. Useful tools for getting your message out on the internet -- and other items. Each purchase helps us better wage the battle for verifiable elections. You can also help the fight for clean elections & the precinct strategy -- and help your family fight infections, viruses, swine flu or any other potential plague -- by investigating and purchasing MMS mineral breakthrough ($20 per year per family!) at www.NetworkAmericaStore.com -- seriously, this may be our only hope against a real or contrived plague or pandemic. We urge you to check it out for your family's sake. BEFORE AMERICA GOES DOWN THE DRAIN! If you watch the YouTube Video immediately below, -- and then read the next 13 articles listed -- you will be an expert on this subject. 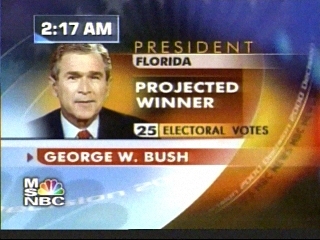 (Updated August 15, 2007 -- still holds in 2010) What actually happened on Election Night, 2000, 2004, and all the other election nights since at least as far back as 1988. The mechanism by which 4 private companies have been delegated the power to nullify the voters' choice, and substitute their own. Eye witness report from election night 2004! A HOUSE WITHOUT DOORS by Jim Condit Jr. Explanation of Proven Votefraud in the 1996 GOP Iowa Caucus against Presidential Candidate Pat Buchanan and the people of Dubuque, Iowa -- perpetrated by ABC, CBS, NBC, CNN, and AP wire -- through the corporation they jointly own: the disgraced Voter News Service, now renamed National Election Pool. (FOX Cable News was not a factor in 1996, but FOX joined the Computer Votefraud Syndicate cabal by 1998.) Prove to yourself that all the Big TV Networks and AP wire owns National Election Pool (formally Voter News Service) by clicking on NEP's website here. 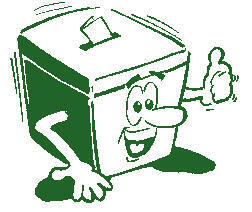 PANDORA'S BLACK BOX: DID IT REALLY COUNT YOUR VOTE? What is the MOTIVE behind computerized votefraud? Aren't the Democrats watching the Republicans, and the Republicans watching the Democrats, -- and isn't the news media watching them both? The answer is: NO! There is a larger force, -- a force which effectively controls the Republican and Democratic Parties, the 4 big Computer Vote "Counting" companies (ES & S, Diebold, Hart, Sequoia), and which completely controls the 5 Big TV Networks (ABC, CBS, NBC, CNN, FOX). The "Competition" feigned by the Big TV Networks to Project "Winners" and "Losers" on Election Night has always been a HOAX -- and ABC, CBS, NBC, AP wire, (1975 to 2007) CNN (1992 to 2007) and FOX (1998 to 2007) -- KNEW it was a hoax all along. They were basing their "winner" and "loser" projections on alleged results from election day exit polls conducted by the sinister Voter News Service (VNS), a company which the Big TV Networks and AP jointly own. Far from engaging in any competition, the Big TV Networks were getting the exact same information, at the exact same time, from a company they had jointly created, and jointly owned. Keen observers noticed that the TV Networks never bragged at later times when they were first to project the winners on camera. Reason: the competition was a show -- the real purpose of the alleged exit poll information was to prepare the public mind for the rigged computer result about to be announced a few hours later. The exit Polls themselves have always been completely fraudulent. The exit pollers miss the rush hours of voting in the AM and PM. They start at 10 AM and quite at 5 PM. Citizens for a Fair Vote Count videotaped a real exit poll in New Hampshire during the 1996 Republican Primary which was won by Patrick Buchanan. The woman taking the exit poll for VNS is pictured at the link above, and she told us that only 1 out of 15 people would talk to the exit poller. Now, if you miss the rush hours of voting, if only 1 out of 15 voters will talk to the exit poller, if there are so few exit polls in the United States that you can hardly find anybody who's ever seen one -- then where is any possible scientific basis for these things? There is none, and they are a hoax perpetrated by the 5 Big TV Networks and their creature Voter News Service (now renamed National Election Pool) to psychologically war against the America people by perpetuating the acceptance of easily rigged computerized vote "counting" by a few private companies who are fixing all key elections for the Ruling Elite. See Picture and explanation by clicking on link above. Democrats accused Republicans of stealing the election, while Republicans questioned whether Democrats could read a simple ballot, but behind the 2000 presidential election meltdown was a brilliant plan contrived to bring about radical changes in the way votes are counted--changes at the heart of the current touch-screen controversy. This affidavit was one of several given to a Congressman's office during hearings in Columbus, Ohio on December 13, 2004. The main affidavit comes from Sherelle Eaton, the Deputy Director of the Hocking County, Ohio Board of Elections. Executives and owners of the two largest private "vote counting" companies, ES &S and Sequoia, have been convicted of bribery and suborning public officials in more than a dozen states. These two companies were delegated the power to count 60%+ of the USA vote in secret in Presidential Election 2004. "There's one story about this election that we'll never know: what happened inside the machines that do not have a paper trail. It's somewhat reassuring that, in most instances at least, final exit polls and other external systems give us roughly the same picture that the election results do. But suppose that wasn't the case? This is what audit trails are for.¼"
Contrary to the claims of "opposition" groups such as Move On, Paper ballots won't cure electronic voting ills. At first glance, the call for independent monitoring of the machines (e.g., Democrats want voting machines audited) seems to solve the problem, but does it really? Not if the those doing the auditing turn out to be no more "independent" than the now-defunct Voter News Service (VNS) was. If the monitors are chosen by the joint leadership of the Democratic and Republican Parties, then third parties, Independents and other non-partisan voices will be kept out of the process. If the Republicrats at the top decide that the Big Five TV Networks (ABC, CBS, CNN, Fox and NBC) are the "outsiders" they'll use for their "independent" auditing, then we'll be back exactly where we were when the Big Five together owned the VNS! 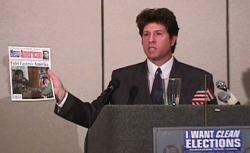 Right before election 2000 and the 45 day computerized vote-counting "crisis" between W. Bush and Al Gore in Florida -- there was only ONE candidate (Ken Lowndes) and ONLY one organization (Citizens for a Fair Vote Count) in the world warning the American people about the Computerized Votefraud Syndicate and their accomplices, ABC, CBS, NBC, CNN, and FOX. A few of our early radio ads were a bit off, and had to be pulled, due to the fact that the Buchanan Presidential campaign did not remain a contender after Buchanan got the Reform Party nomination. Buchanan failed to remain a contender primary due to TOTAL censorship by the 5 Big TV Networks and the absurd exclusion of Patrick J. Buchanan and Ralph Nader from the Presidential Debates -- even though Buchanan was on the ballot in all 50 states!. Even so -- the general principles in all 12 of the year 2000 radio ads of Congressional Candidate Ken Lowndes --- remain both sound and constructive today. The Full Story Behind the "prophetic" Radio Ads aired during the 2000 Presidential Campaign." This is the "why" behind the content used in the Radio ads aired on the "honest elections vs. computerized votefraud" issue during the 2000 Presidential Election. Keep on top of Big TV News Media Manipulation (the 5 Big TV Networks coordinate their news EVERYDAY) and the real meaning behind world events. Also -- the only Action Plan that can peacefully and constitutionally save America. Step 2: as of 6-15-07 -- because of all the spammers -- you will get a confirmation email almost immediately. Open it and click on the "confirmation link". Without this second step, you will not be subscribed. Accomplishing this second step makes sure that you are on tier 1 "preferred delivery." It also lets our system know that YOU are subscribing, and also protects us from any spamming charges. IF you do not get the confirmation email -- email me at votefraud@fuse.net with "confirmation problem" in the subject line so I notice it immediately. Thanks.